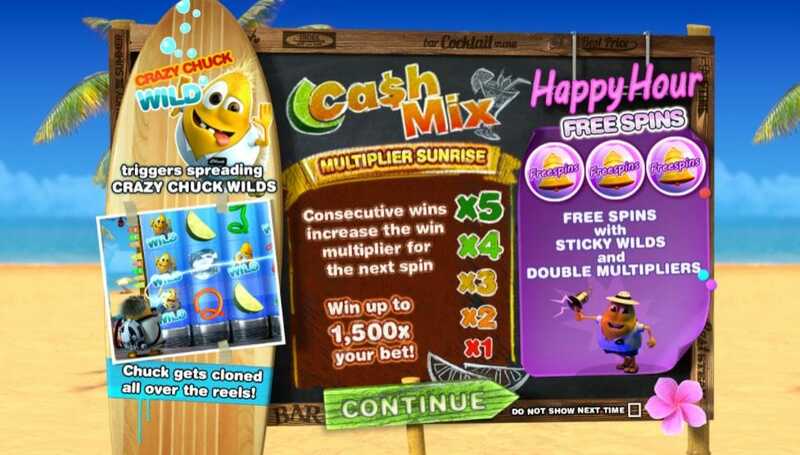 Opening with a crazy cutscene depicting mad potato-headed bartenders and at least one oddball wannabe scientist, Cash Mix introduces itself as a light and silly online Slots Games, designed for some light-hearted, low limit betting. The bonus tropical music, featuring plenty of steel drum, confirms this. Set in a beach bar, a yellow cartoon characters (Minions is an obvious influence) stands by the bar, wiping glasses clean and waiting for you to make your play. Check out Slotsbaby to find cool features! Leander Games is an independent company providing quality slots online as well as a range of other casino games. Their innovative concepts and features are balanced by top quality art thrilling gameplay, simply some of the best slot machine games on the market. It’s clear that this is no ordinary beach bar and not only because it’s staffed by potato-headed yellow guys! There’s an element of mad science at work with their cocktails. In the middle of the bar is the Gameboard. The 5 reels are huge water tubes containing the spinning reel icons across 3 rows. Cocktails and mixers litter the exterior of the bar while a bell is hung to the side to signal happy hour and last orders. In the background is the sun, the surf and the sea. Deckchairs and parasols line the beach while palm trees creep into view from the sides of the screen. There are 15 winlines along the left-hand side – hover over one to see the line appear. There is also a multiplier counter on the right-hand side. Low value icons are 10, J, Q, K and A, rendered in different colour bendy straw shapes and utterly charming for it. Higher value icons are all representative of cocktails: a slice of lime, a strawberry, an olive on a cocktail stick, a decorative paper umbrella and a cube of ice. Crazy Chuck, one of the yellow bartenders is the WILD in this online slot – ingeniously, he literally goes wild when he gets stuck in one of the tubes (reels). Doc, the mad scientist of the group, then appears to try and free him with his shrink ray. Instead, the hapless scientist will clone Crazy Chuck WILDS all over the board! Free Spin bell tokens are the SCATTER in this casino game. 3 or more landing on the board will trigger the Happy Hour Free Spin round. During free spins, the SCATTERS become sticky WILDS but sadly, no more spins can be retriggered. The multiplier, dubbed the Multiplier Sunrise, increases a level when achieving wins on consecutive spins. Any spin without a line win resets the multiplier to 1x. During Happy Hour Free Spin rounds, the Multiplier Sunrise values are doubled, maxing out at 10x instead of 5x.